The Instruction Manual with safety guidelines for the Thermomix® TM5 is provided with your Thermomix®. If you have misplaced your copy, click here to download the TM5 Instruction Manual. Thermomix® may only be repaired by an authorised Thermomix® Repair Centre. Use only parts provided with the Thermomix® or original spare parts provided by Thermomix®. Never use the Thermomix® in combination with parts or equipment not provided by Thermomix®. Failure to comply with any of the above may render your warranty void. For further information on authorised repair centres please contact us. 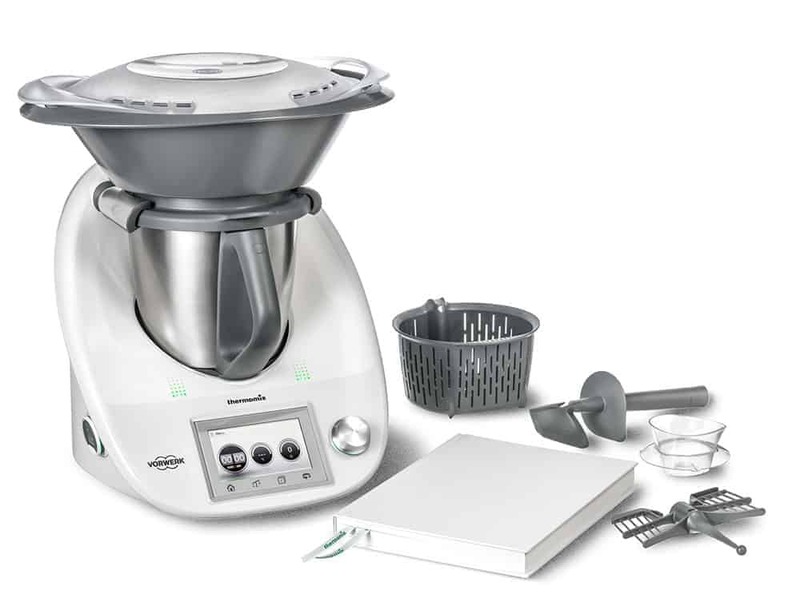 Thermomix® combines the functions of more than twelve kitchen appliances into one easy-to-clean compact unit. It can weigh, mix, chop, grind, knead, blend, whip, emulsify, heat, steam, cook and stir. Whether you are preparing daily meals for the family, making yourself an occasional snack or spoiling guests with fancy recipes − with Thermomix®, it can all be done in a flash. The spectrum ranges from simply boiling eggs and making salad dressings and dips to pesto, steamed fish, risotto and ice cream. It can also be used to crush ice, make doughs and cake mixes and blend refreshing smoothies and shakes. This is why the Thermomix® has five million enthusiastic users and is the most popular food processor of its type in the world. HOW DO I COOK WITH THE THERMOMIX®? The short answer is that you can cook very quickly and extremely easily. The concept of the Thermomix® is based on a perfectly complimentary combination of sophisticated, intelligent cooking technology and customised recipes that are tailored to the Thermomix® to ensure perfect results time after time. You can follow the on screen instructions and quantities or you can refer to the hundreds of recipes online, or in Thermomix® cookbooks and newsletters, or you can adapt your own favourite recipes. WHAT IS SO SPECIAL ABOUT COOKING WITH THE THERMOMIX®? The invention of the Thermomix® 50 years ago was a revolution – a food processor that brought together almost every step in the process of food preparation and cooking. Thermomix® provides an extra pair of hands in millions of kitchens and helps our customers produce nutritious healthy meals quickly and easily. 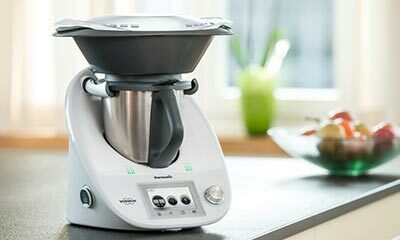 Thermomix® customers are provided with personal support and a precise demonstration of all functions from local representatives before purchase. After purchasing their Thermomix®, customers continue to receive individual support, have many opportunities to compare notes with experts and like-minded people and are able seek information, ideas and valuable tips both in person and online. Today, Thermomix® has advanced into the digital world with recipes available on the integrated touchscreen and a unique Guided Cooking feature. DO I NEED ADDITIONAL ACCESSORIES? Your Thermomix® comes with a complete set of accessories. The accessories include the Varoma attachment for steaming, which makes it possible to easily preserve nutrients in fresh ingredients and cook low-fat meals. There is a simmering basket for side dishes such as rice, potatoes or vegetables and for sieving fruit juices. The butterfly whisk is easily attached to the knife and is used for creating light fluffy textures – mouses, whipped cream and whisked egg whites. A Thermomix® spatula is also supplied. Beyond this, no further individual parts are required to use the entire range of functions. The Thermomix® is designed with quality and efficiency in mind − even the sealing plug for the lid of the mixing bowl can also be used as a measuring cup! IS THE MATERIAL USED FOR MEASURING CUP AND VAROMA LID FOOD SAFE? The health and well being of our customers is of greater concern to us at Vorwerk than anything else. Therefore, Vorwerk commissioned the Rhineland technical monitoring authority (TÜV Rheinland) to thoroughly examine the relevant parts as an independent and critical institution. Since TM5 is launched, both Measuring Cup and Varoma Lid are made of high quality material, which is BPA free. This means you can continue to have faith in the fact that the dishes you create so quickly and easily with your Thermomix® are not only delicious but also as healthy as the fine ingredients you use to prepare them. 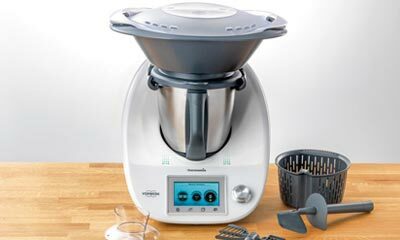 WHERE CAN I FIND RECIPES FOR THE THERMOMIX®? Thermomix® customers benefit from a unique, comprehensive and diverse selection of recipes. A wide selection can be found in our Thermomix® cookbooks, on our Recipe Chips and on the Thermomix® Recipe Platform. And the best place to start is the Basic Recipe Book with 166 recipes that comes with your Thermomix®! Those who enjoy discussing their cooking experiences and would like to share recipes with others can meet at local cooking classes or contact members of the online fan base via the official community pages or Facebook. WHO IS THE THERMOMIX® DESIGNED FOR? The Thermomix® is the ideal solution for any lifestyle. Thanks to its versatility and numerous cooking applications, it can be used in so many different ways. Parents who cook for themselves and their families every day find it to be a fast and uncomplicated kitchen assistant that saves time and helps them to cook fresh and healthy meals. People just learning to cook benefit from the fact that it operates independently and that cooking is simplified with reliable recipes and the Guided Cooking feature. More than a few users have grown from amateur cooks into smart hosts thanks to Thermomix®. Passionate hobby cooks are also inspired by the variety of culinary delights on offer and often begin to experiment with the Thermomix® for themselves to discover entirely new dishes. Even professional and gourmet chefs, who depend on consistently perfect results, trust the Thermomix®. HOW EASY IS THE THERMOMIX® TO CLEAN ? Cleaning the Thermomix® after cooking is very simple. If there is food residue, simply pour a little water and detergent into the bowl and then turn it on at level 10 for a few seconds. This will remove most residue from bowl and lid and if necessary the bowl can be taken apart and placed in the dishwasher or washed by hand as you prefer. All the individual parts of the bowl are dishwasher safe. The Thermomix® itself can be wiped with a damp cloth. IS THE THERMOMIX® A GOOD INVESTMENT? With Thermomix®, there’s no need to buy a range of different kitchen appliances – this single compact unit does it all. Thermomix® users around the world experience the savings they make from cooking from scratch every day. Less trips to the supermarket, less takeaways and more efficient cooking. And they expereince restaurant-quality food at home, and meals that are more healthy and nutritious. Customers also receive much more than a technically exceptional product with proven Vorwerk quality with their purchase. Aside from the security of knowing that they have the ultimate multi-functional food processor, the service, support and recipe community offered in conjunction with it also add great value to this complete cooking solution. WHERE CAN I BUY THE THERMOMIX®? Thermomix® is available direct from one of our Thermomix® Advisors. Our advisors will offer you a comprehensive showcase of the unique functions of the Thermomix® and after-sales customer service and ongoing support. For more information on cooking show and purchasing a Thermomix®, please click here. HOW MUCH DOES THERMOMIX® COST? Thermomix® is an advanced, premium kitchen appliance that replaces numerous other culinary tools and delivers great value for a lifetime of use. The price for Thermomix® is SGD2320. For more information on cooking shows and purchasing a Thermomix®, please click here.